To celebrate 50 years of Bullitt, Ford enlisted Molly McQueen, the granddaughter of actor Steve McQueen, who rolled onto a Detroit stage in the new limited edition 2019 Mustang Bullitt. 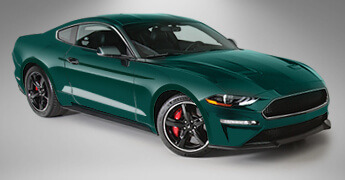 Fifty years after Steve McQueen defined cool for a generation in the film, Bullitt, the good guys at Ford Motor Company have ordered a reboot of the classic Highland Green Mustang fastback that beat a Dodge Charger at its own tom-foolery on the hilly roads of San Francisco. 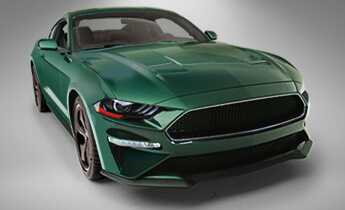 In the summer of 2018, Ford began production of the 2019 Mustang Bullitt. This 50-year tribute to the car-guy film, Bullitt, features all of the amazing style and performance that makes the Ford Mustang America’s most popular muscle car, such as a V-8 engine, six-speed manual transmission and limited slip differential. 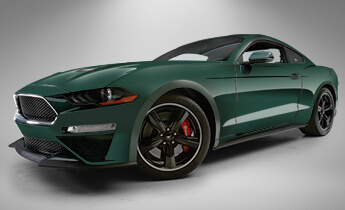 The new Mustang Bullitt salutes the 1968 movie car with understated appearance, available classic Dark Highland Green exterior paint and subtle chrome accents. It enhances these classic elements with the features that make today’s Mustang the best-selling sports car in the world. This grand-prize Mustang Bullitt is fully loaded with all of the content available on the Mustang GT Premium. It also includes extra-cost Brembo six-piston front brakes, a larger rear anti-roll bar and an oversized radiator. • Bullitt Technology Package, including B&O Play 12 speaker stereo, navigation, and Blind Alert Information System with Cross Traffic Alert. 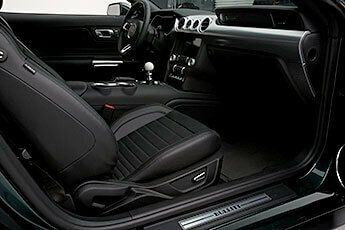 • Recaro Sport Seats, black leather with accent stitching, manual adjustment. Ford’s bold new Mustang Bullitt is tough and street smart. Powered by an advanced-engineered V-8 engine pumping out 480 horsepower, it’s a muscle car not to be challenged. 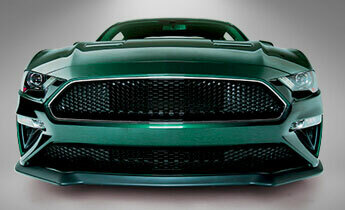 Feast your eyes underneath this grand-prize Mustang Bullitt’s hood. You’ll find all the makings of a true thoroughbred trained to excel in performance and fun. Based on the 460hp V-8 in the Mustang GT Premium, the limited edition V-8 in this grand-prize Mustang Bullitt sports a high-flowing intake borrowed from the Shelby GT350, open air-filter element, larger throttle bodies and powertrain control module recalibration. Now turn your attention to this grand-prize Mustang Bullitt’s driveline. Enter and win, and you’ll love telling your family and friends it’s Bullitt-proof, thanks to a quick-shifting six-speed manual transmission and Torsen limited-slip differential. 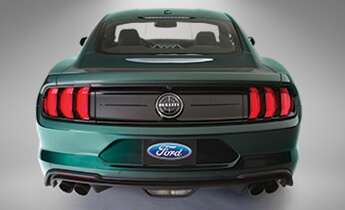 Remember, this grand-prize Mustang Bullitt is your all-access pass to fun, fun, fun. You can’t buy it, but you can win it in the 2018 Mustang Dream Giveaway. Don’t miss your chance to win this pair of Mustang Bullitts. When you enter and win, you’ll take home both the restomod 1968 Mustang Bullitt and a brand-new 2019 Mustang Bullitt equipped with Ford Performance parts, plus we pay $25,000 for the taxes.